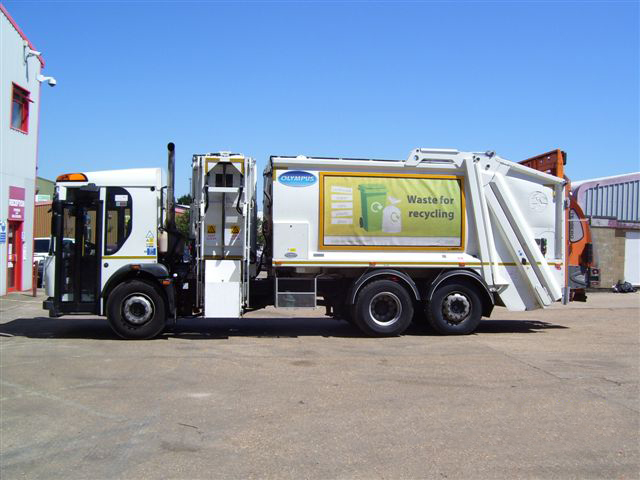 To facilitate the roll out of a new refuse and recycling collection service on the Isle of Wight, waste management company Island Waste (a subsidiary of Biffa), turned to contract hire and fleet management experts Specialist Fleet Services Ltd (SFS) to provide a new fleet of purpose built vehicles. The five-year contract is worth £1.4m and comprises seven RCV’s, all Dennis Elite 6x2 with Olympus 16 Duo bodies, fitted with Terberg Omni-Del bin lifts and kitchen waste pods. In February 2012 Island Waste launched a new refuse and recycling collection service on the Island. The new service has involved the distribution of over 50,000 green wheelie bins to residents to replace black bin bags and the introduction of alternate weekly collections of refuse and dry mixed recyclables. Kitchen and food waste is now collected every week. Northampton-based SFS is a member of the Rothschild Banking Group and one of the most experienced contract hire and fleet management companies in the UK. SFS runs its own vehicle workshops as well as on behalf of local authorities, and provides specialist vehicle hire and fleet management services to the public and private sector.